Adjustable frame is suitable for any type of walls and is used when the wall is uneven or inclined. Find the extreme point, which will serve as a frame zero point, using the rule and spirit level. Use a tape measure and a marker pen to mark the guide rails fitting points. Marks should be put at a distance of 60 cm from each other and wall edge. Suspenders to be fixed at a distance of not more than 50 cm from each other to ensure the proper frame rigidity. Therefore, mark the points with the spacing of 50 cm. Using the automatic level, mark the vertical axis and suspenders’ fitting points every 50 cm. The first and the last suspender on the guide rail should be fixed at a distance of 10 cm from the floor or ceiling. Fit the suspenders with screw anchors 6×40. Bore holes and fix the suspenders using a hammer drill and corresponding drill bits. When all necessary holes are bored, dispose of rubbish. The deviation for wall panels’ guide rails that lay in the same plane is up to 2 mm for 2 m. Use a digital electronic level to adjust the guide rails’ alignment. Fix the guide rails with a screw gun and self-tapping screws 3.2×16 in the suspender aperture. Once fixed, bend open the prominent parts of suspenders. The plane flatness can be checked with the reference rail or rule. Panels are installed with the groove down. The first row is laid on special wedges to keep the expansion space of 10-15 mm and adjust the horizontal level of panels. Fix the first row to guide rails via the panel front side. Keep the indent from the base at a height not more than the height of baseboard-to-be. 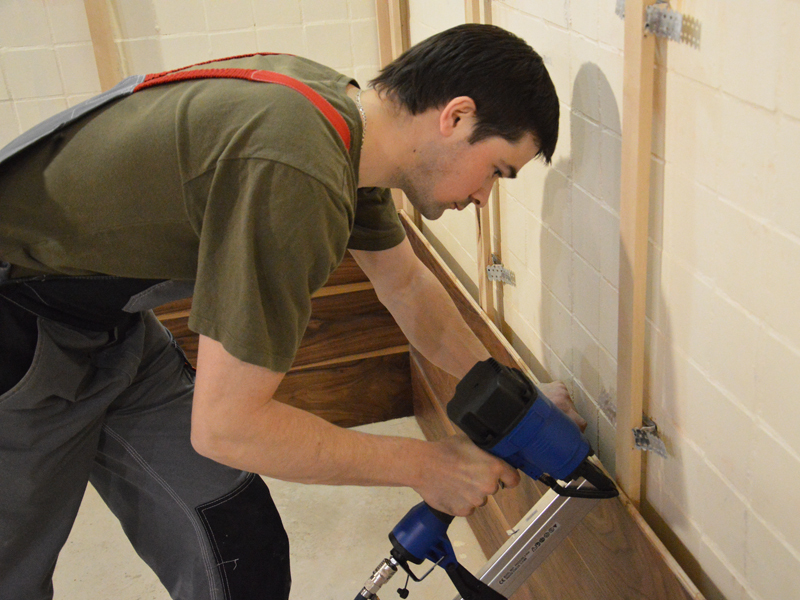 Fitting is carried out by means of a pneumatic pin gun. Pins used should be at least 22 mm in length to fix panels to the frame properly. When laying the last row, keep the expansion space of 10-15 mm. If necessary, cut the panel along with a power jigsaw considering the expansion space. Mark and cut the panel only at the rear of the panel. When panelling columns, corbels and walls with outboard angle, use special transition mouldings. Lay the baseboard from the angle. Use a cross-cut to cut the necessary angle on the baseboard (internal/external) and fix it. 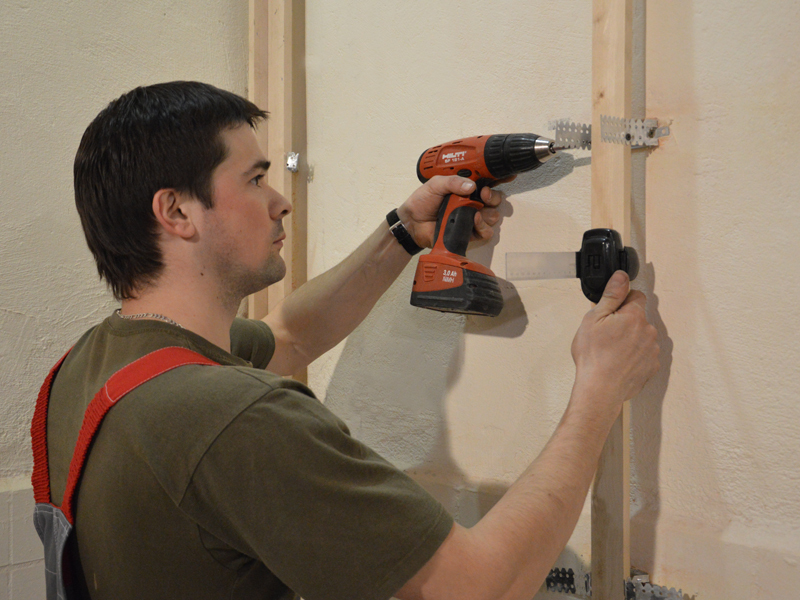 The baseboard is fixed directly to the wall by means of the pneumatic pin gun. Pins should be at least10 mm longer than the baseboard/moulding. Fixation points should be at the distance of 40-50 cm from each other. Furbish the fixation points using a grease pencil.